Read on for our best advice for first time skiers and snowboarders then share with your gang or hit the hill & give it a shot yourself, you'll be conquering the mountain in no time! Learning to ski from a friend may sound like a fun idea but trust us when we tell you that it's better for everybody if first timers take a lesson from an experienced instructor to help get the basics down. 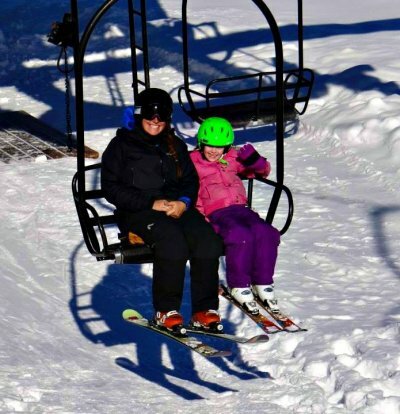 Ski & snowboard lessons help to build confidence & increase the likelihood that you'll want to continue with the sport. Everyone in the group can conquer the mountain at their own speed then meet up and exchange stories at apres ski. Nothing will ruin your time on the mountain faster than the wrong equipment or an ill fitting boot. Don't worry when you rent with Epic we'll take the time to custom fit your boots and skis, we'll make sure you're boots fit properly (snug but not pinching) and that we send you out on the best ski or board for your ability and riding style. Do a quick weather check before you head out and dress in layers so you can quickly adjust if conditions change. Avoid cotton and instead opt for moisture wicking materials like polyester nylon blends in your socks & base layers. While it seems counter intuitive, a thinner wool sock actually keeps your foot warmer and fits inside your boot better than a thick cotton pair, when it comes to ski socks less really is more! Haven't you heard? Helmets are cool again! Protect what's most important and wear a helmet, it's a pretty small price to pay to protecting what's priceless. A note for parents, if you're putting kiddos in ski school, helmets are required & you'll find it's much cheaper to rent from Epic than a resort store, you can add a helmet to any package for just $5 a day! 5. Go Back for More! We know it can be a challenge to learn a new sport and no doubt there will be a few tumbles in the process but the biggest tip we can offer is to keep trying and pushing yourself to go back for another run. No one ever became a great skier or rider overnight so keep a smile on your face and your eyes on the next turn!